The great example of the late Russian baroque, the gilt-domed Nikolsky Cathedral, is situated on the bank of the Kryukov Ńanal. The cathedral was built at the instance of Prince Golitzin who offered Empress Elizabeth to erect in Saint Petersburg a temple to Saint Nicolas, the celestial protector of all sailors, and thus to honor the glory of the Russian navy. The project of the cathedral was worked out by architect Chevakinsky who was also entrusted to direct the construction works started in 1753 and finished in 1762. For the new cathedral the former Navy troop court parade ground was chosen. The consecration of the cathedral took place on the 20th of June 1762. Empress Catherine the Great herself attended the solemn ceremony. The two-storey cathedral is a cross in a plan. It is crowned with five gilt domes and lavishly decorated with moldings and columns of Corinthian order. The splendid combination of the golden domes, blue facades and snow-white columns makes the cathedral look festive and elegant. Nikolsky Cathedral consists of two churches — upper and lower. The lower church was consecrated to Saint Nicolas Wonder-worker who is considered to be the patron of all travelers. The upper church was consecrated in honor of the Epiphany. 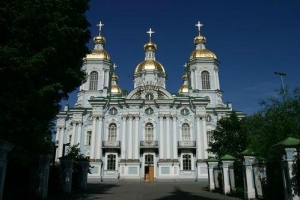 Thus the full name of the cathedral is Nikolsky Epiphany Cathedral. The upper church treasures a wonderful well-preserved iconostasis created by outstanding master I. Kanaev. The iconostasis is richly decorated with vegetative ornaments and classical colonnade and features priceless icons created in Byzantine traditions by the brothers Kolokolnikov. The most honored sacred object of the cathedral is the icon of Saint Nicolas Wonder-worker that dates back to the 17th century. Close to the cathedral the elegant four-tiered belfry crowned with a gilt spire was constructed. The belfry became not only the organic element of the splendid ensemble but one of the well-known frequently depicted sights of Saint Petersburg. In honor of Russian glorious victories over Turkish and Swedish fleets Catherine the Great endowed the cathedral with ten sacred images and since then Nikolsky Cathedral became the sort of museum of Russian naval glory. As Nikolsky Cathedral was a naval church, solemn divine services held there marked the important evens in the life of the Russian Navy. To celebrate the glorious victories of the Russian Navy thanksgiving services were held. In Nikolsky Cathedral the deceased sailors-heroes were prayed for. To commemorate those perished in 1906 in Russian-Japanese War the memorial plaques were installed on the walls of the cathedral. In 1908 the obelisk commemorating the crew of the Alexander III battleship that was sunk in Tsushima Battle on the 14 of May 1905 was erected in the churchyard. After the revolution of 1917 Nikolsky Cathedral had hard times. And although the considerable part of the cathedral's decoration was lost, the temple wasn't ruined and even wasn't closed as many other churches of St Petersburg. During the blockade of Leningrad metropolitan Alexy I, the future patriarchy of all Russia, lived there and hold services. Nowadays Nikolsky Naval Cathedral is a functioning Orthodox cathedral that carefully cherishes its long-standing memorial traditions. In 1989 the walls of the cathedral were enriched with one more memorial plaque commemorating the crew of submarine Komsomoletz. And just recently the memorial plaques with the names of the decedent sailors of the submarine Kursk were added to the cathedral's walls. In the cityscape of the historical center of Saint Petersburg a large 18-storey building of the AZIMUT Hotel St.